Had an experimental event at hack.rva last night–Maker Monday. The idea is to have a monthly meetup for anyone working on a project, high- or low-tech, futuristic or old school, to come together to learn something and to get some work done! I’m hoping this will be an event young makers feel comfortable attending, with their adult of choice. I’ve been thinking about working on a kinetic sculpture that involves a motor to rotate part of the piece. Kent shared with me a small motor he salvaged from a CD player (the motor opened the tray), that can be powered by AA batteries. Brilliant! 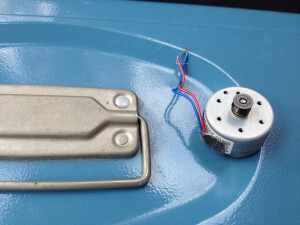 Hopefully, I’ll be able to rig up a gear mechanism with a rubber band and get all the rotation I need. Kent’s box of “art stuff” also got me thinking, that maybe this kind of reuse and sourcing of materials could be a way for RVA Maker Guild and hack.rva to partner with Stuff Redux, since they do not currently accept donations of “computers or other technological devices.” Maybe if devices are broken down and then sorted into useable parts, there could be a place for this stuff. Honestly, this is the kind of stuff I would love to find in a reuse center–tiny motors, metal rings, gears, etc. Something to think about. 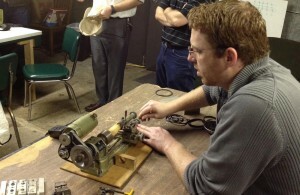 Aaron brought in a vintage Unimat mini-lathe/mill to demo. I love the beauty of vintage tools made out of sturdy metal, no plastic or gaudy colors in sight! And it even lives in a lovely wooden box.. I’m romanticizing this, but it was very sweet…and even a little dangerous. Probably circa 1960 and used by model-making enthusiasts. It was great to see and I hope Aaron will demo how to make a pen with it. 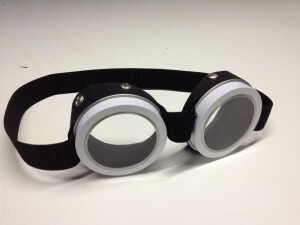 Grant brought in a prototype of a pair of awesome, light-weight, steampunk goggles he’s working on for his niece and nephew. They are made out of readily available materials and look super-cool. I’m hoping this is a project the Maker Guild can tackle. In other news, Melanie was working on an e-textile project similar to this LED necktie (http://learn.adafruit.com/led-ampli-tie/) and Martes mentioned that The Martin Agency is interested in sponsoring a maker faire in Richmond some time in the future. Exciting! The next Maker Monday is November 18th.